Implementing fitness equipment around football, track, baseball or any sport field is a great way to integrate light conditioning on the sidelines of practices or can be used by players to warm up and keep muscles loose during games. Useful at junior high, high school or college level sports, the stationary bike's minimally resistant movement is great for athletes returning from injury slowly trying to get back into the swing of things. Strengthens hamstrings, quadriceps, calves, and glutes. Builds overall cardiovascular fitness, endurance, and muscle tone. Lowers cholesterol, blood pressure, and reduces risk of obesity-related diseases. The Recumbent Stationary Bike is an excellent piece of outdoor fitness equipment that can be used to improve cardiovascular fitness. The low impact workout can be used when recovering from an ankle or foot injury, for beginners new to working out or to cool down and relax muscles after higher intensity workouts. The state of the art finishing process used on the Recumbent Stationary Bike combines the application of an 'Electrocoat Zinc Rich Primer' with a durable polyester powder-coat top layer to ensure every crevice and joint is completely sealed, providing full protection against	corrosion and weathering. 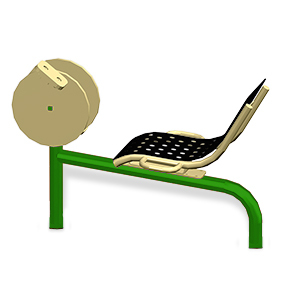 Recumbent Stationary Bikes are finished in either a gloss or textured polyester powder-coat finish.